Configure the properties of the well from the Details Panel. To display the description of the well, including the well owner and the full path of the imported .duwell file, mouse over the well in the Well tree. Click on a well to display and configure the well properties in the Details Panel. Surface Location — This displays the surface location of the well in X and Y coordinates. Curve — Select a curve from the LAS file to display the well. Class — Whenever you create/load a well, a default class setting will be assigned to render the well information. Unit — The unit of measurement for the well curve is by default showing the unit in the LAS file. You can override the unit of measurement in the LAS file by selecting another unit in the drop-down list if the information in the LAS file is not accurate. If you have selected a DEPT curve, you will not be able to edit the Class. The Class will automatically be set to Depth (MDSS). Units for calculated well curves, such as Checkshot Vint, are fixed when they are created. However, they can be displayed in different units by adjusting the Display Units in the View Preferences menu (see View Preferences). Show path in views — Select this check box to display the well path in section and 3D views. Show path on map — Select this check box to display the well path in the Map View (see the following image). See the following section to configure the display of the well path. 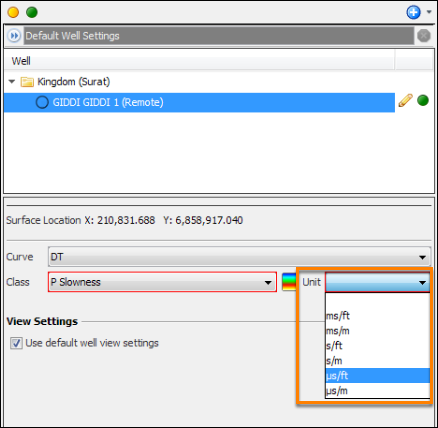 Show density display — Select this check box to display the log information of the wells according to the log curves of any class. 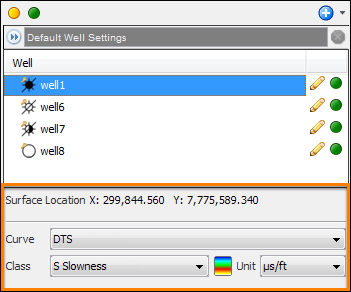 Show wiggle display — Select this check box to display the wiggle data of the wells in section views. Turn off the "show density display" option to see the wiggles. Show annotations — Select this check box to display the well annotations in the views. Show distance on sections — Select this check box to display the well projection distance in section views. Rotate to follow path — Select this check box to rotate the display of the well to follow the well path. Show intersections on sections — Select this check box to display the point intersections of a deviated well path in section view (i.e. if the IL/CL/2D line/Arbline crosses a well path). The colour and size of the symbol can be configured in the adjacent fields. Map Symbol Colour — Select your preferred colour to display the well symbols in the Map View (see the following image). 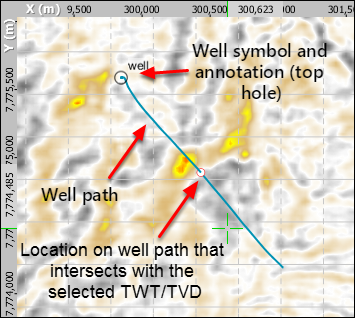 Map Annotation Placement — Select your preferred location for the well symbol and name in the Map View (see the following image). Available options include Top Hole North East, Top Hole North West, Top Hole South East, Top Hole South West, Bottom Hole North East, Bottom Hole North West, Bottom Hole South East and Bottom Hole South West. With this setting, you can choose to place your well symbols at the top or bottom of the well holes and place the well names at a specific direction around the holes. You can configure this setting per well basis to create a nice display of wells in the map if you have many wells that are located closely. Display Name — Select your preferred display name based on the defined name, number or UWI. 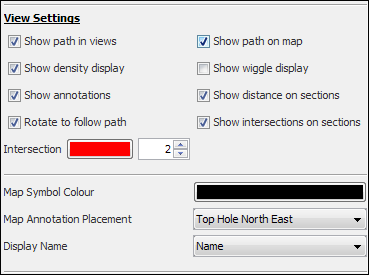 Section Path Colour — Select your preferred colour to display the section path of the well in the section views. Section Path Thickness — Type a value to set the thickness of the section path of the well in the section views. Projection Dist. (m) — Type a value that will determine how close a well has to be to a crossline or inline marker to be displayed in the section views. The distance of the well from the IL/CL markers is displayed in brackets beside the well’s name. Display Width (mm) — Type a value to set the display width of the well in the section views. Tip: If you have many wells, you may want to reduce the projection distance and/or display width to make the output more readable. Show — Select Marker And Label to display the markers and labels of the wells in the views, Marker Only to display only the markers, or None to hide both the markers and labels of the wells in the views. Label Colour — Select your preferred colour to display the marker labels in the section views. Line Thickness — Type a value to set the line thickness of the markers displayed in the section views. Line Overrun — Type a value to set the overrun length of the markers displayed in the section views. Open Marker Spreadsheet — Click this to view and edit the markers data in a spreadsheet (Well Markers Table). In this spreadsheet, you can hide/display the markers in all the views, change the line colours of the well markers and assign colours/patterns for the different lithology layers. You can also edit the values of the markers (see Opening Marker Classification Sheet). Note: When importing wells from Kingdom, Insight requires you to manually assign a unit for the curve. The unit field will be left blank and displayed with a red border until you select a unit.